I actually wasn't really looking for a new shaving brush, but I was already for more then one year interested in the silvertip badger shaving brushes from Whippeddog. And that's why I finally decided to buy one anyway. The Whippeddog shaving brushes are on the internet best known for its outstanding value for your money. Because you get a silvertip shaving brush for a very sharp price compared to other brands like Muhle and Edwin Jagger for example. I personally have chosen to put the knot 10mm deeper for $ 5 extra, because that results in a knot length of total 45mm. Setting the knot on 45mm would ensure that the shaving brush has more backbone, which is especially useful when you face lather. Whippeddog sends the shaving brushes in a small envelope and therefore the hair is flattened and the knot seems much smaller than it really is. I also noticed how big the handle is in proportion to the knot, and especially in the beginning it was something to get used to. I personally think the knot doesn't look big, but rather chubby, and that is because the knot is set 10mm deeper into the handle. 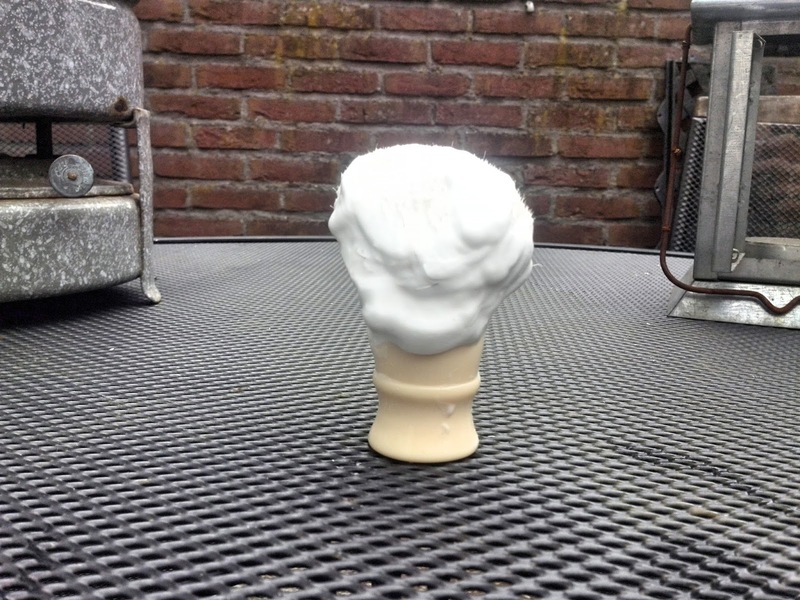 I honestly expected that the tips of the hair would be white, but that is with this shaving brush more beige/white. It took about 3 to 4 shaves to break-in the shaving brush. Already during the break-in period I noticed how soft the shaving brush feels to the face during face lathering, and actually this is just another wow feeling. I also notice that this silvertip shaving brush has more than enough backbone and it definitely doesn't feel floppy, and I suspect that I own that by letting the knot to be set deeper in the handle. If I compare the softness of the hairs with the Virginiasheng Finest Badger Shaving Brush, then the hair from the Whippeddog 24MM Silvertip clearly feel even softer to the face, and this results in an even more luxurious feeling. However, I have to use more product with this shaving brush then with my Virginiasheng Finest Badger Shaving brush. And that is because of the larger knot of this shaving brush, because usually it is so that a larger shaving brush also uses more product. I'm able to whip up plenty of lather with this shaving brush for more than two or three shave passes. However, the difference in the amount of whipped up lather in comparison with the Virginiasheng Finest Shaving Brush is negligible. I honestly can not say anything bad about the build quality, and the build quality is totally fine. The quality of the imitation ivory handle I find pretty good, and does not look cheap. Also, the knot of this shaving brush is well filled with badger hair, and that shows the high density of the badger knot. But most important, I personally find the knot itself, because if it would lose a lot of hair then that is disadvantageous for the life of the shaving brush. 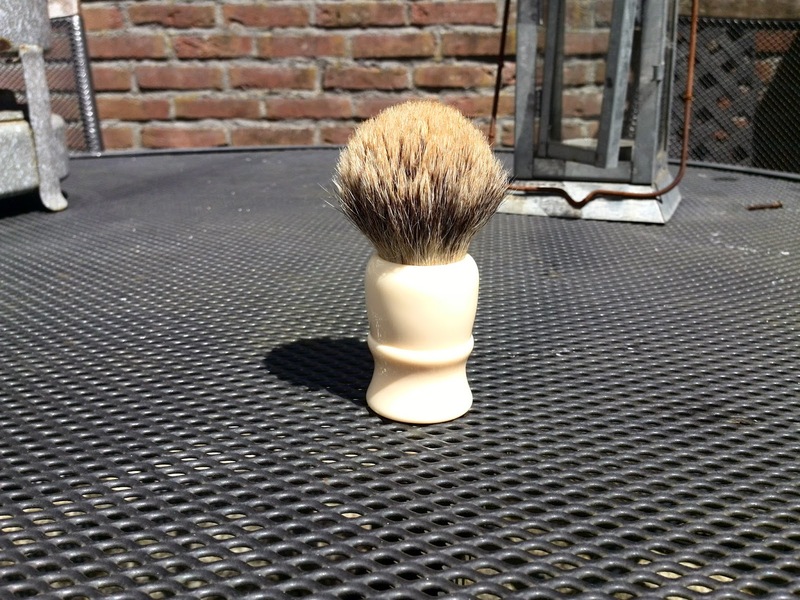 Luckily this shaving brush loses a minimum of hair, and that was even the case with first shave. You can buy the Whippeddog 24MM Silvertip Shaving Brush via the website from Whippeddog for $ 30 or $ 34 when you are living outside the USA. By the way, you don't need to be afraid charged by the customs, because Larry puts $ 10 on the customs form. The Whippeddog 24MM Silvertip Shaving Brush is a luxurious badger shaving brush with the highest grade of badger hair, for a fraction of the price of similar Edwin Jagger shaving brushes for example. However, this shaving brush is a less dramatic improvement in comparison to the Virginiasheng Finest badger Shaving Brush. But personally I find this shaving brush is worth every penny because silvertip badger is more expensive because it is scarce.